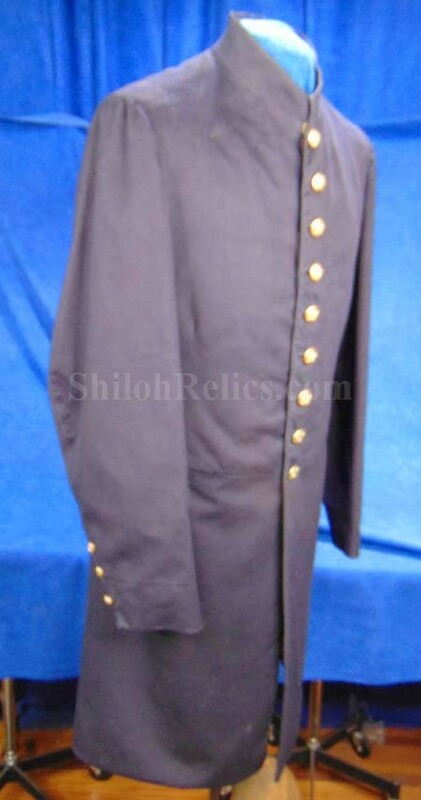 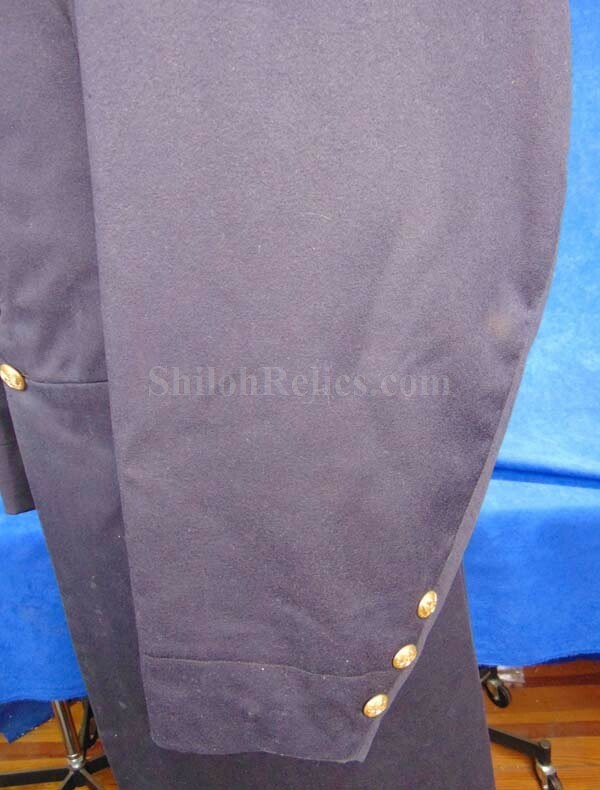 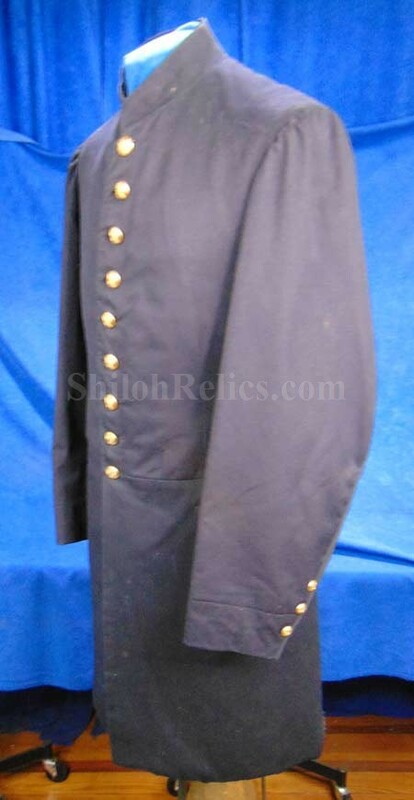 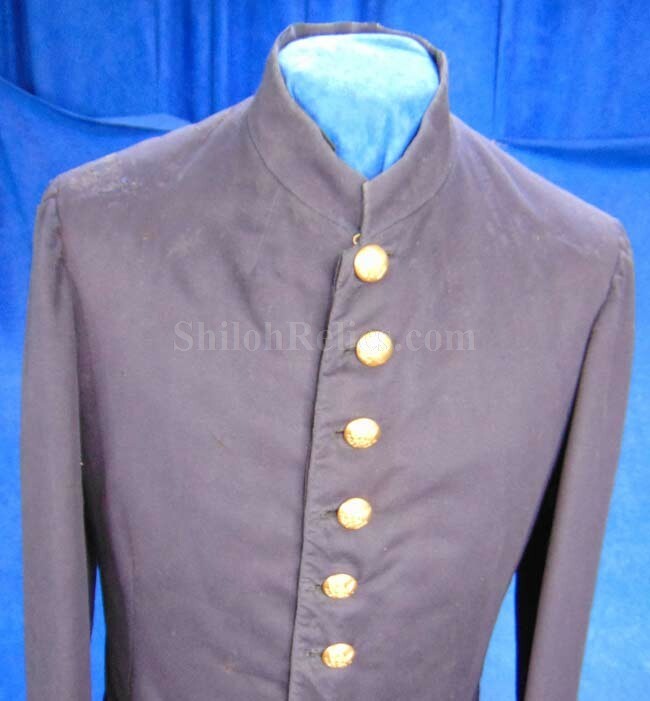 This is an original Civil War officer's frock coat that displays well. 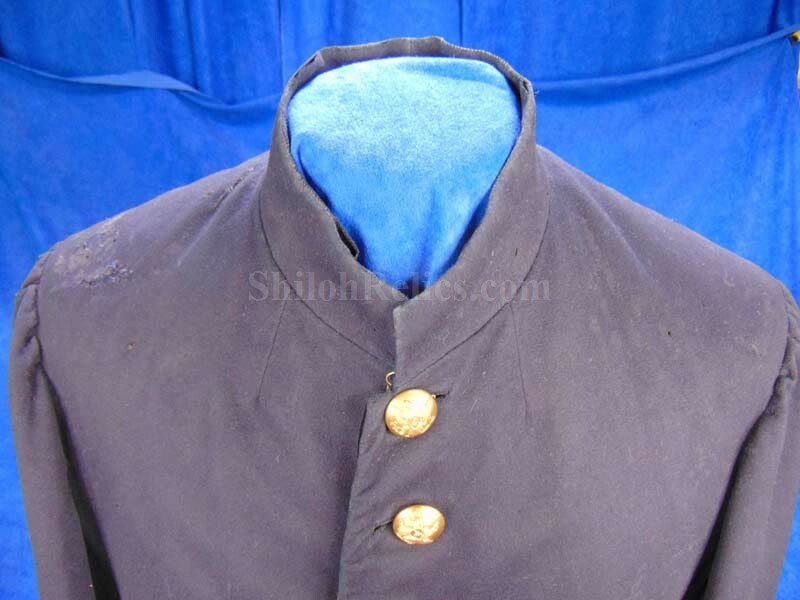 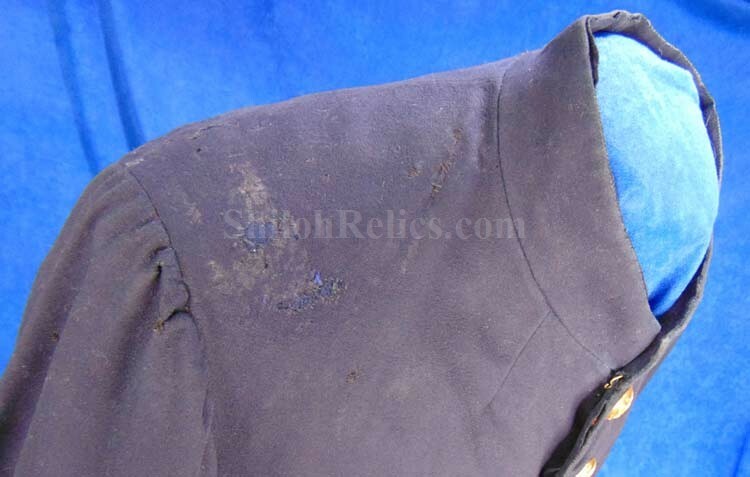 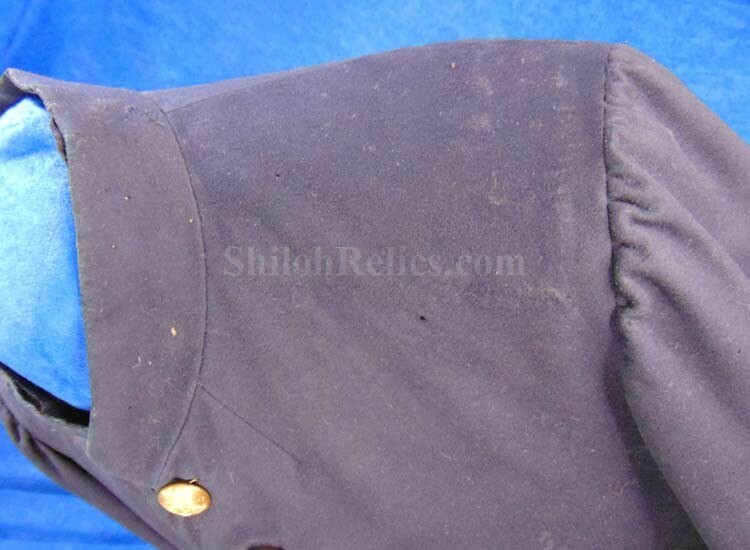 The jacket is constructed of deep blue, almost black wool material that retains all of its nine artillery style eagle buttons on the front. 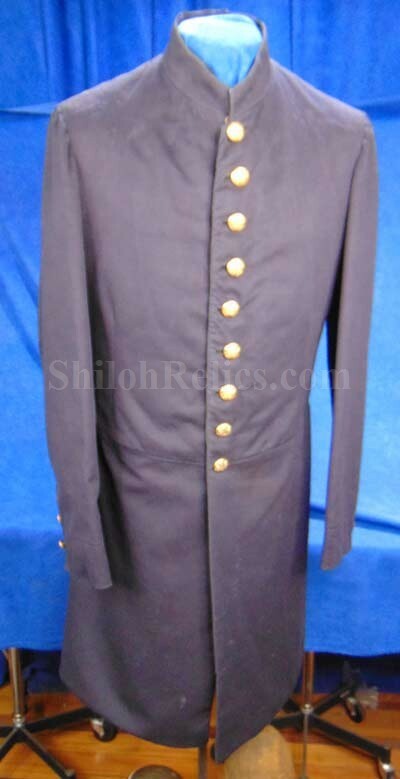 They have the eagle with the shield in the center with the "A" in the center that denotes the artillery branch of service. 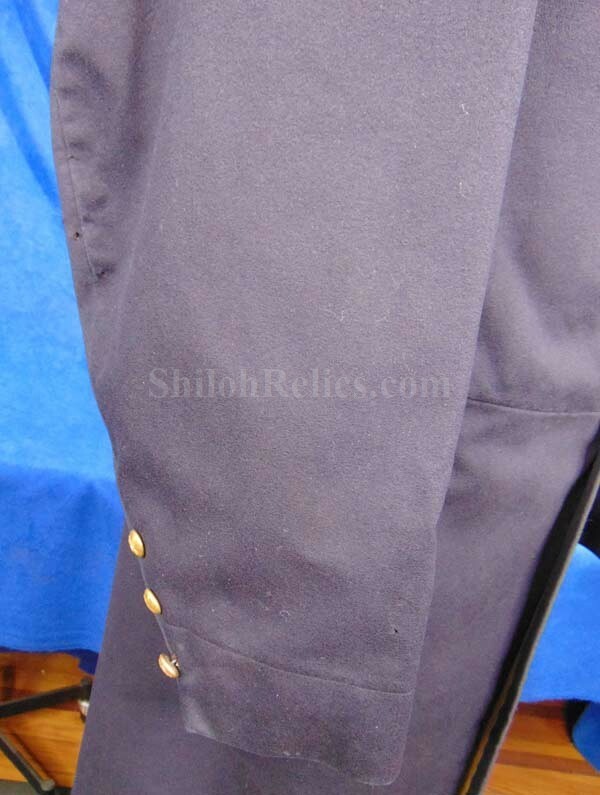 There are three eagle artillery buttons on each cuff. 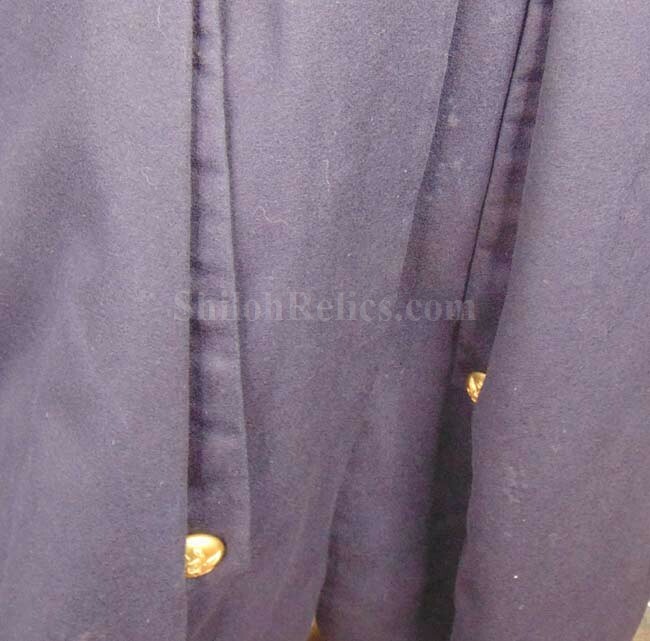 The top seven buttons were manufactured by the famous Scovill Manufacturing Company that was located in Waterbury, Connecticut. 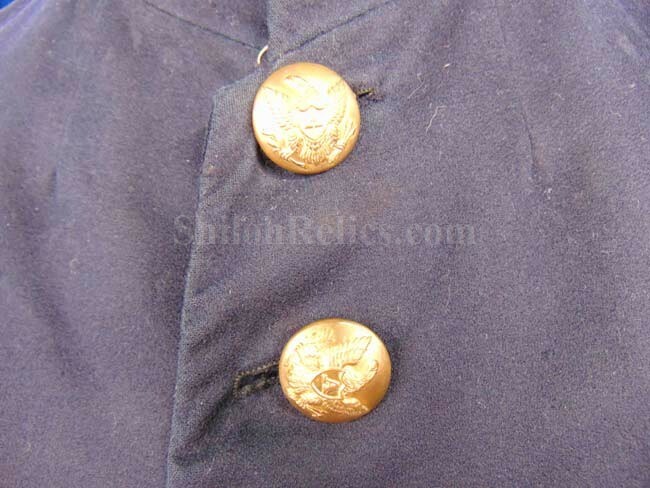 The bottom two are correct Civil War replacement buttons by Horstmann & Allien. 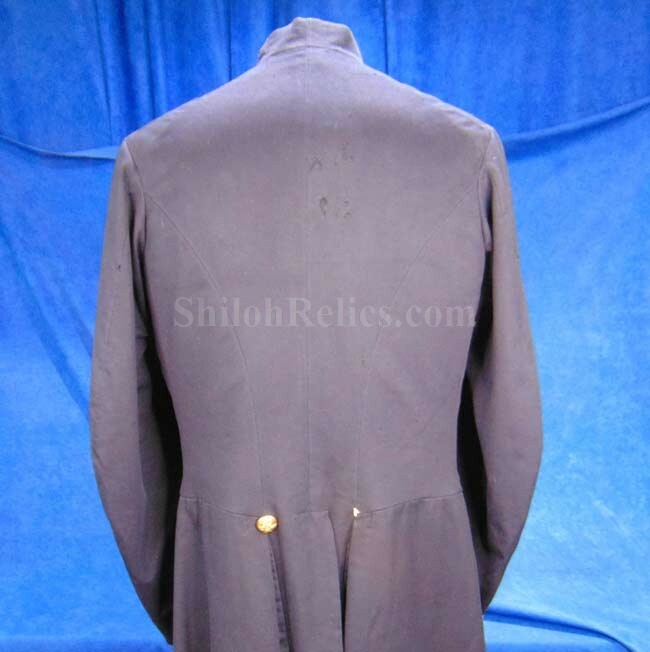 The coat is constructed with distinctively tailored sleeves with the 9-1/2 inch elbows and then narrowing dramatically at the cuffs and tufted shoulders. 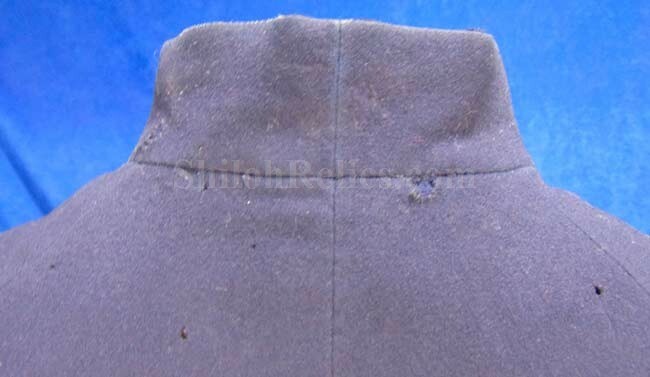 The collar is nice and tall at 1-3/4ths inches. 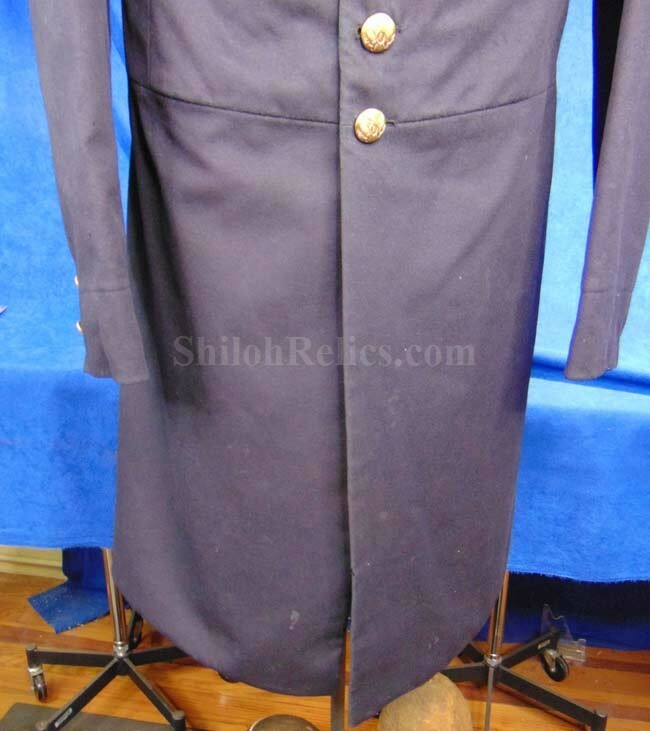 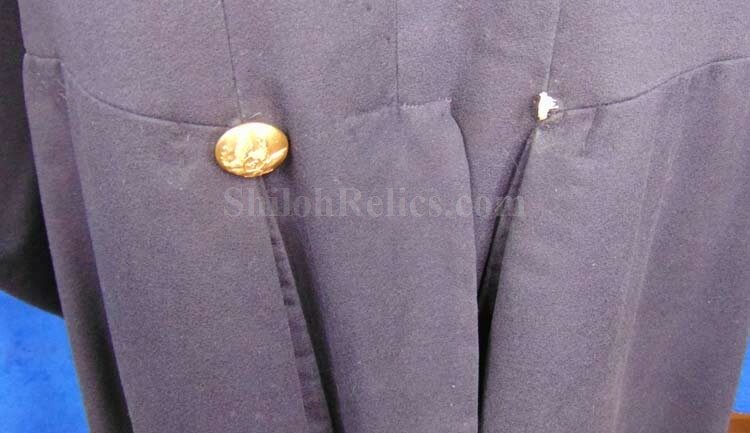 On the reverse of the coat, there are three of the original four tail buttons remaining. 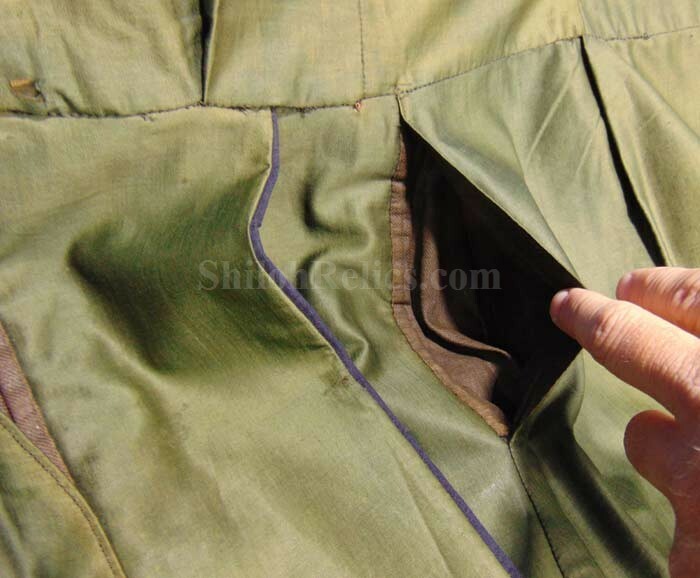 It has the finely crafted the tail pockets inside. 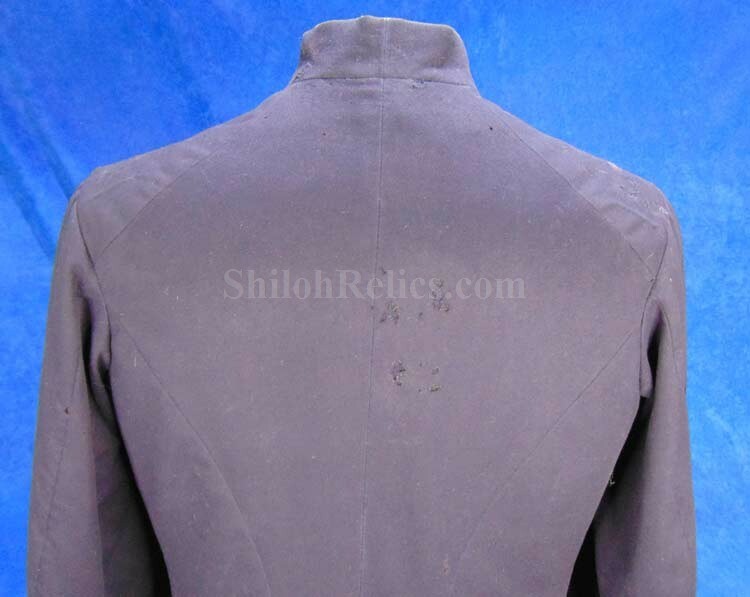 You can see where it has shoulder straps at one time but they are long since gone. 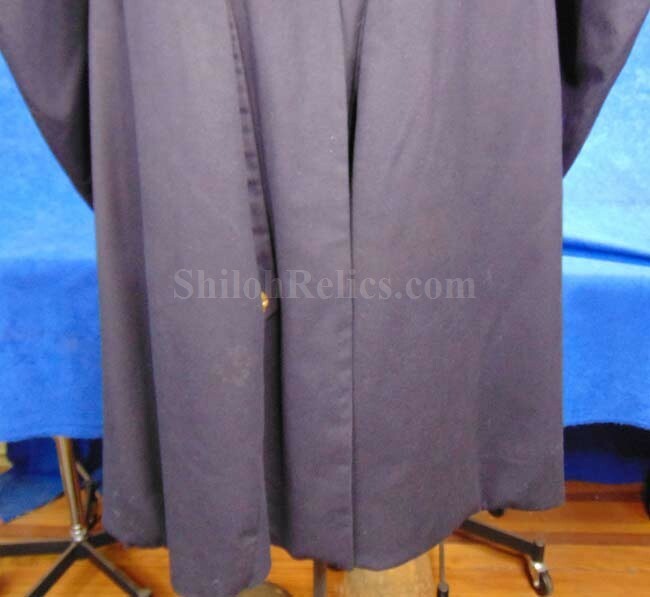 This is a very well-crafted coat. 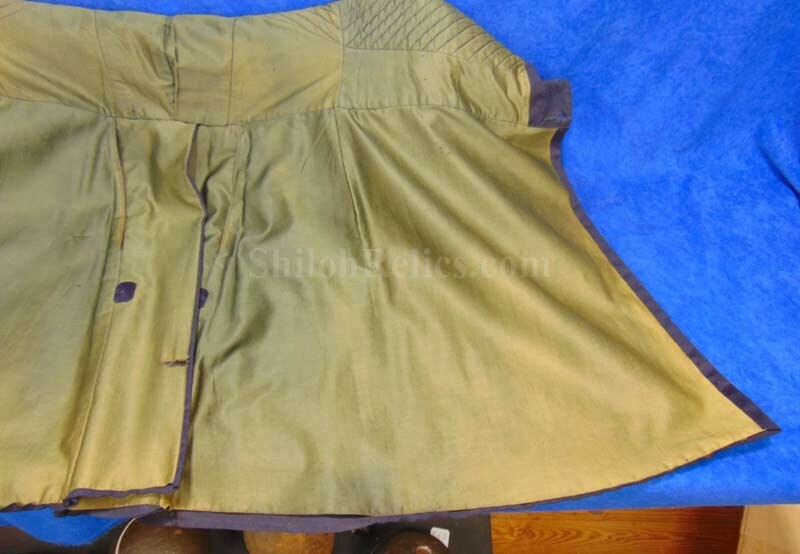 The top has the original collar that measures 1-3/4ths inches tall. 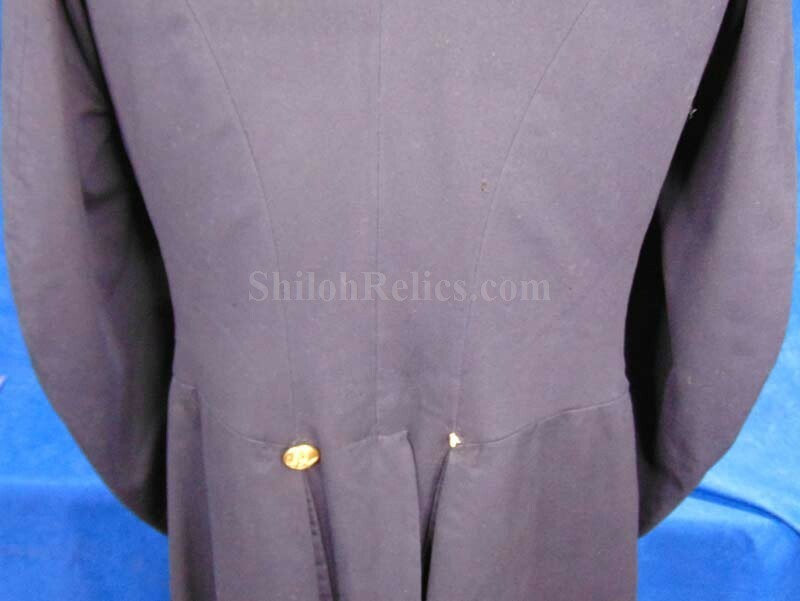 When the coat is opened, the crafting of the inner lining shows that this garment was finely tailored not just quickly assembled. 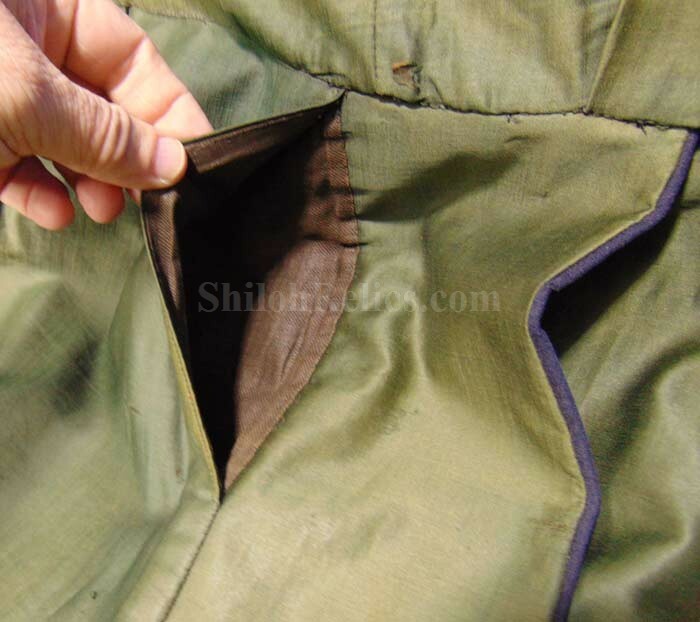 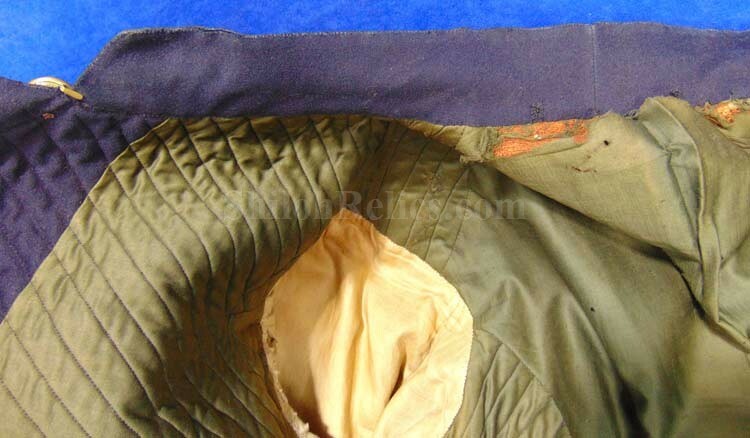 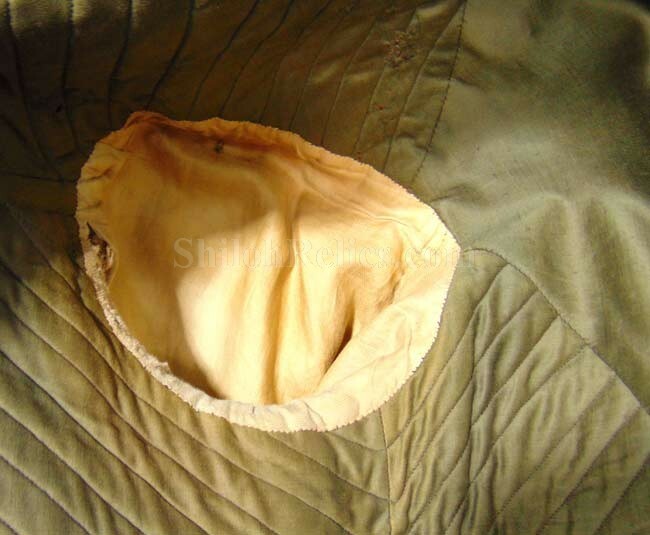 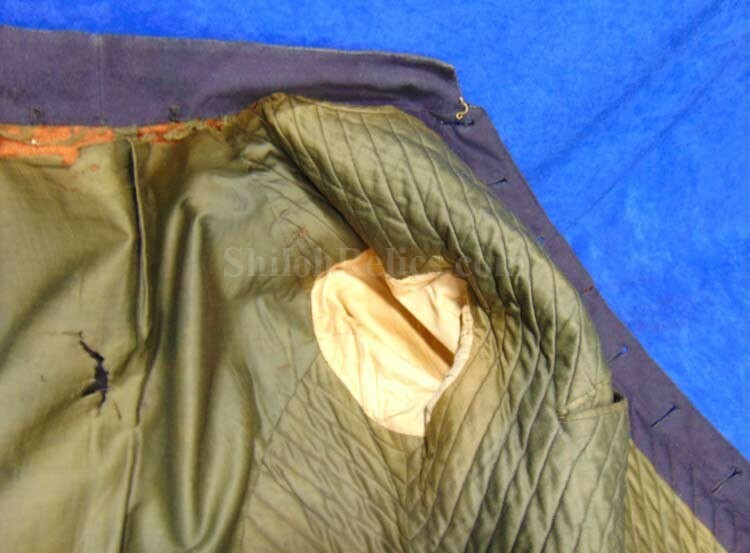 The interior has the typical quilted green polished cotton body lining. 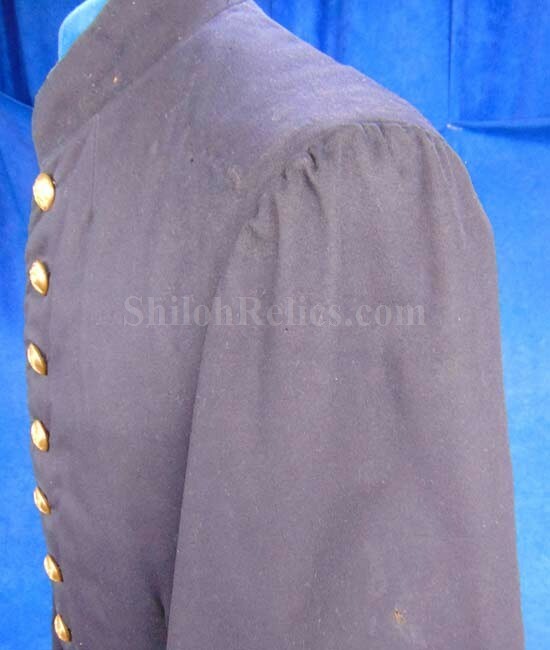 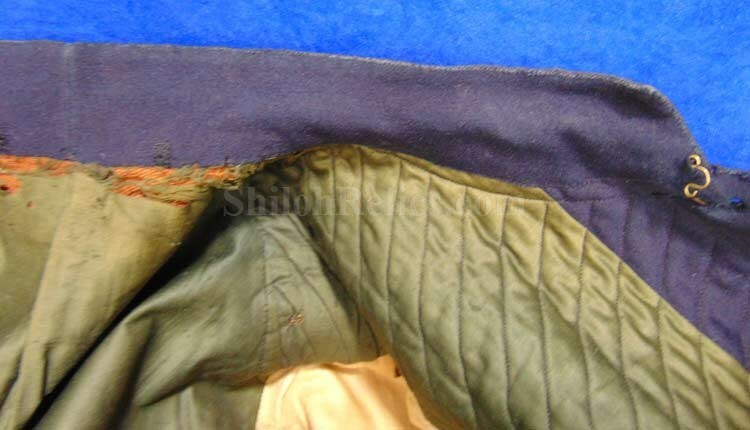 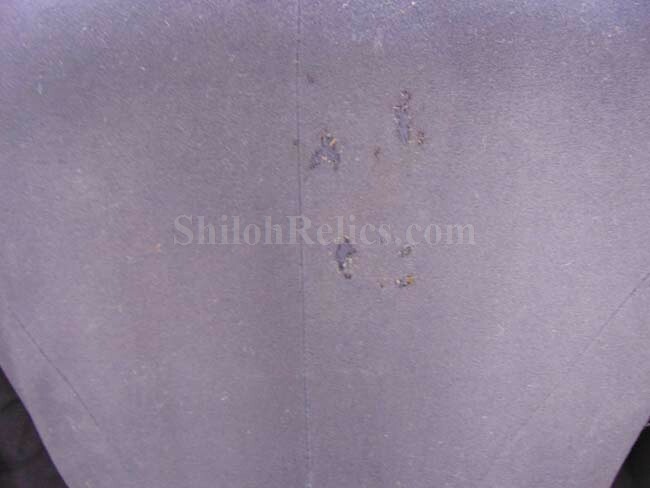 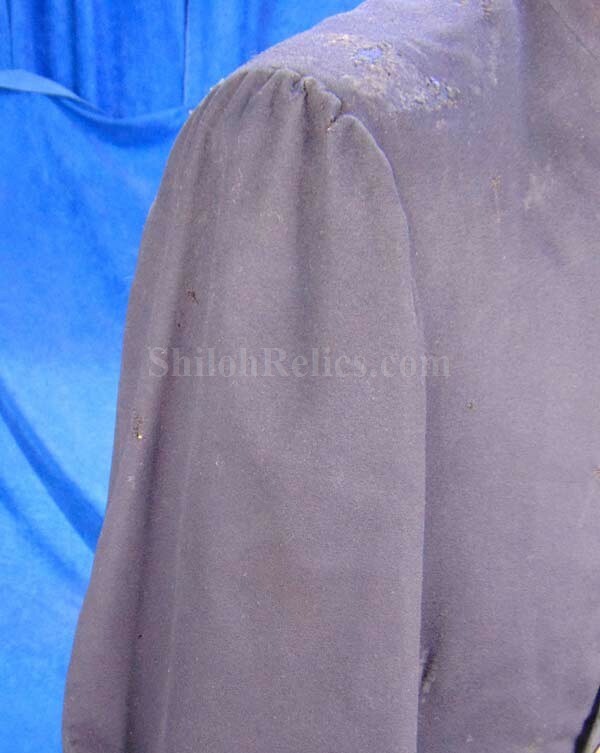 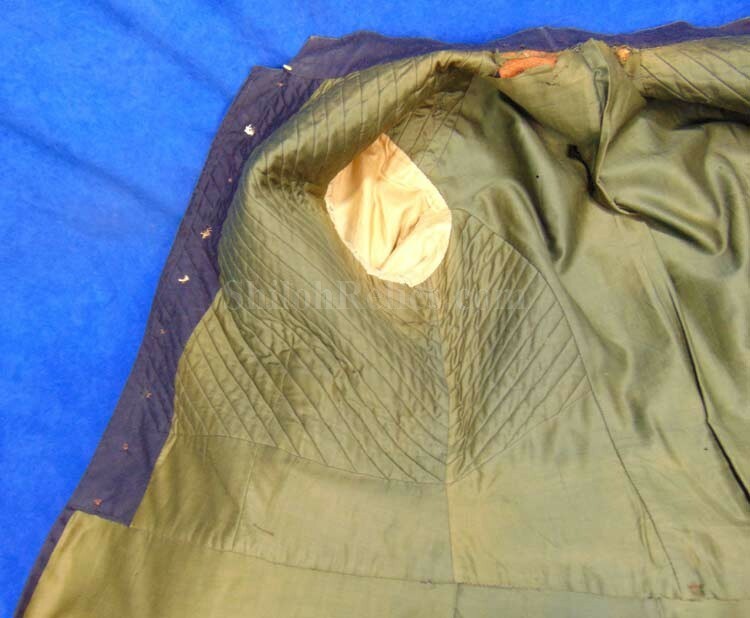 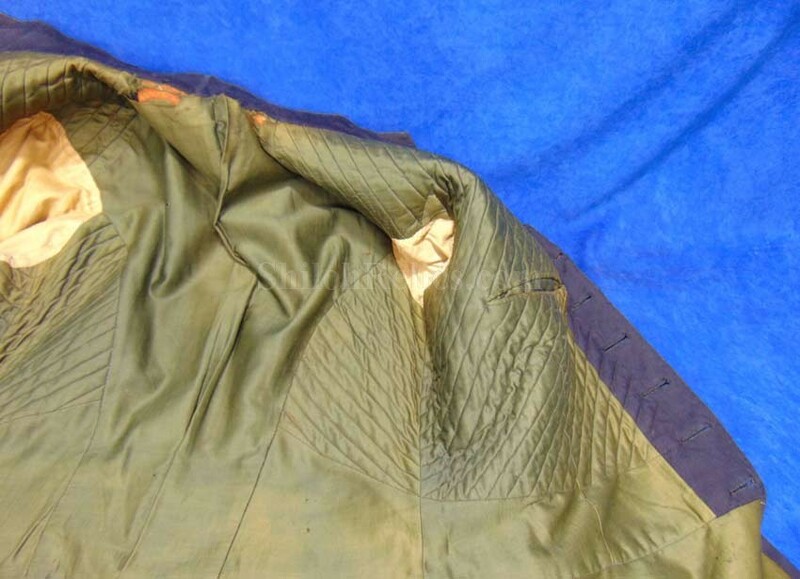 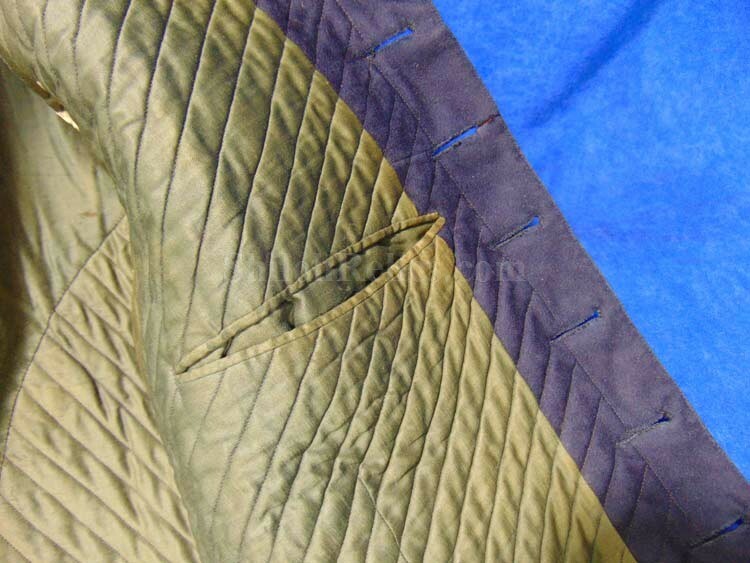 The sleeve linings of the coat are correct white material and date it to Civil War era. 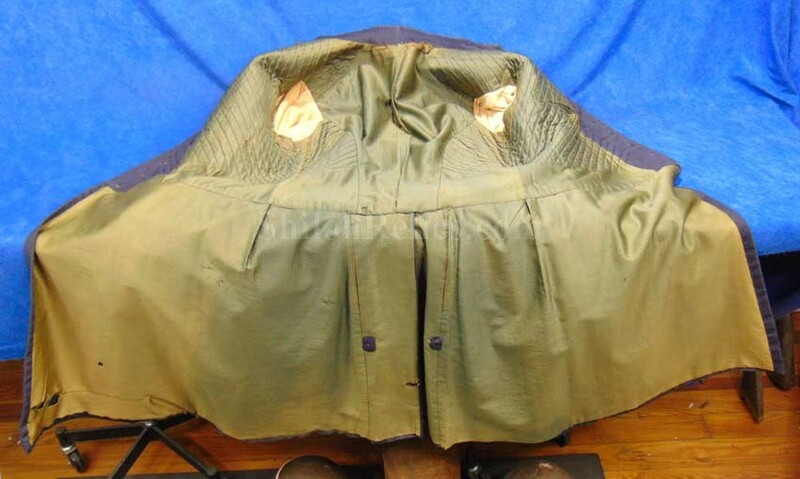 As you see it has some wear but it gives it character. 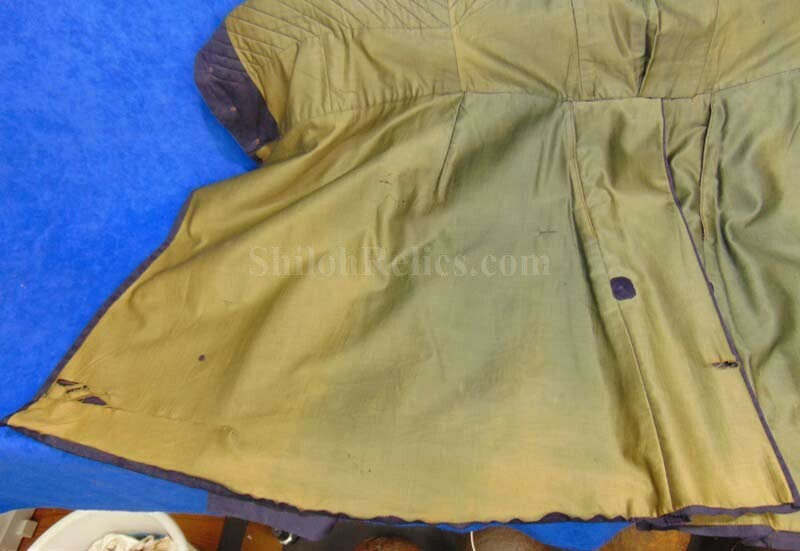 The This is an attractive coat that was actually used and is not just a surplus piece.